So, you’ve now learned how to knit and how to purl. But sometimes a stitch will look just a bit twisted or loose. How do knitting mistakes happen and what can you do to prevent them? Let’s look closely again at both a knit and a purl stitch to see how they should sit on your needles. First things first, to understand the picture below, you may want to know a little about the pattern used to make the swatches (the little knit squares) I’m showing you. This pattern is called “stockinette.” For a stockinette stitch pattern, you would knit a row, turn, purl a row, turn, and repeat.This leaves you with a pattern that shows all knit stitches on one side and all purl stitches on the other side. Learn more about stockinette stitch here. Let’s look at what knit and purl stitches typically look like, without mistakes. As you can see, a knit stitch is shaped a like a “V” on your needle. The video above helps your eyes to see the Vs. The two sides of the V are called “legs.” (For example if ” \/ ” represents one knit stitch, \ is the left leg, / is the right leg). To avoid twisted stitches, you should make sure the right leg of the “V” is in front of the needle, while the left side of the “V” is on the back side of your knitting needle. Looking at a purl stitch side, you will see that each purl makes a little upside down “U” on your needle. As with a knit stitch, you should make sure the right leg of the “U” is on the front side of your needle; the left leg will be behind your needle. Now, lets look at some knitting mistakes. The stitch coming off the needles in the picture above is twisted. Look closely at the base of teh stitch and you can see that the legs are crossed. If you see your knit legs cross when they shouldn’t, put the twisted stitch back on your needle (un-knit it) and re-knit it through the front leg. Sometimes you’ll get further along in your project and find a spot in your work that doesn’t stretch properly. You can see in the photograph above, that one of the stitches doesn’t stretch like the others do. Instead of stretching the opening of the “V” wider, a twisted stitch closes tighter when you pull on your work to check it. When the stitch was twisted, it made the legs cross when they shouldn’t. If you’ve gotten a few rows in and spot a twisted stitch, don’t worry; you can still fix these knitting mistakes. You’ll follow the same method for fixing dropped stitches. First, let’s quickly look at a dropped stitch to see what that mistake would look like. Dropping a stitch simply means a stitch has fallen off your needles at some point. If you drop a stitch you can simply place it back on your needles. If you didn’t notice the dropped stitch and kept knitting, you’ll have a loose loop that will unravel when stretched. You can fix the dropped stitch though. Don’t pull on your work, and follow the instructions to fix a dropped stitch. Now that you can spot and identify your knitting mistake, let’s try to fix it. 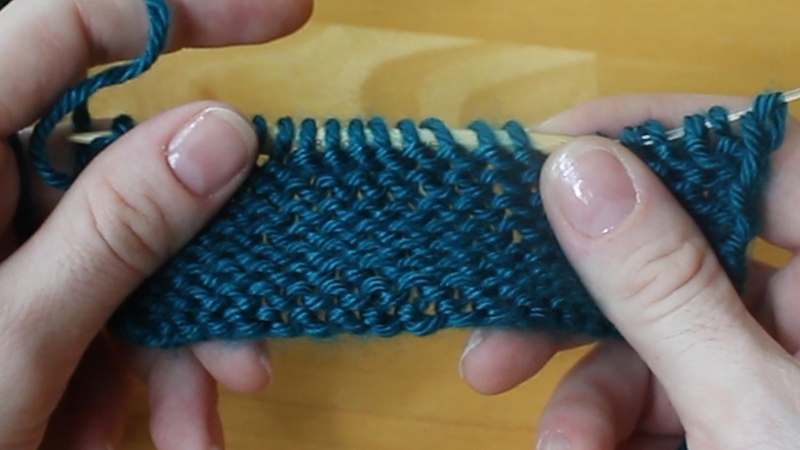 Learn how to fix a twisted stitch or dropped stitch in your knitting on the next page.